Easy to use software developed for Software programmers, Database professionals or beginners and other similar business users to adapt with changing technologies. 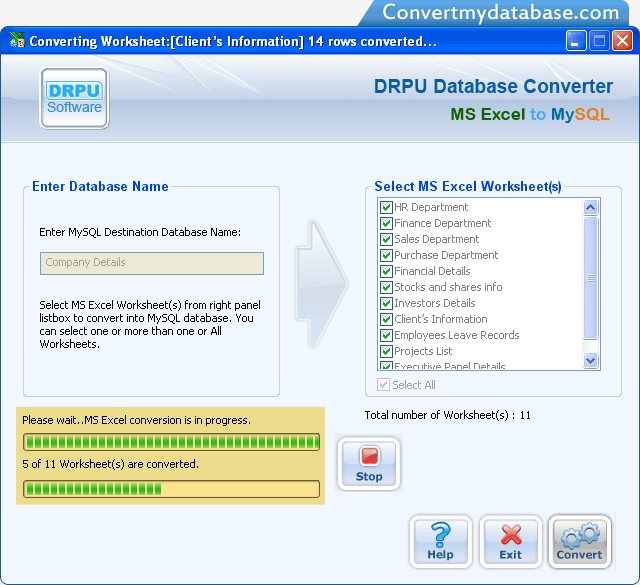 Now with database conversion utility all your database related queries can be easily solved. Software with advance technology converts database records of Microsoft Excel worksheet to MySQL format and thus saves your time and money required while converting records manually. MS Excel to MySQL Database Converter Software works with all major versions of MySQL server and supports all database data types and attributes. Convert entire or selected MS Excel worksheets. Supports major version of MSExcel and MySQL server. Supports major database datatypes, attributes and key constraints.